Good hiring is a team sport. Just coming off the 2012 London Olympics Games, it’s more obvious than ever how important teamwork truly is. Whether it’s the USA women’s volleyball team’s long-standing partnership nabbing them the gold or Usain Bolt and Yohan Blake setting world records in the relay race, teamwork in the Olympics was everywhere. When using video interviewing to evaluate great candidates, hiring managers and recruiters work better when they work together towards the common goal of hiring the best. Why is it important to stress collaboration while using video interviews to screen top candidates? If you don’t want to take inspiration from the Olympics, then how about a cautionary tale. Without using collaboration between hiring managers, departments and coworkers, the odds of hiring a candidate who turns out to be a bad fit increases. Workers who fit into the company culture are happy, productive and enthusiastic about their work. Ill fitting employees are unproductive and their attitude can bring down morale of a whole office. Even worse, they can seriously cost your organization. In fact, one in four employers said a bad hire cost their company more than $50,000! Interview questions are vitally important in learning what you need to know about your potential hire. These questions need to address both qualifications and personality in order to determine organizational fit. 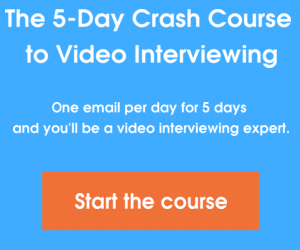 If your company is utilizing a one-way video interview, these questions can even be saved and applied to all relevant candidates. This makes it even more important to focus on making the questions relevant and informative. Get the whole team together and list out the most important things you’ll need to know about the candidate. Is it important the candidate know a particular system or work well in a team environment? These questions will allow you to judge the vitally important qualifications of job seekers and weigh candidates against each other to determine the best fit. Sharing notes and discussions is essential for finding and deciding on great candidates. After viewing a video interview, employees can write down their thoughts and impressions on the candidate. These notes can then be shared with the entire team. Now one employee’s notes have become a springboard for a company-wide discussion about the candidate where everyone you want involved can chime in on the process. No matter how dedicated you are to workplace collaboration, not everyone will be able to make it to your live video interview. This is why it’s important to record the interview for playback later. Like Olympic instant replay, even those coworkers who missed the interview the first time around will be able to informatively evaluate your candidate to see if they would be a good fit for the team. The great thing about video interviews is they make collaboration around the interview process more efficient. Multiple members of the team can sign into your account to replay live interviews or watch one-way video interviews. If you get your whole team to press the play button on talented candidates, it will be easier to reach a consensus. Just like in the Olympics, collaboration is important in attaining your goal. Video interviewing can help hiring managers and department heads collaborate with greater ease, allowing your company to hire gold medal employees. How do you use video interviewing to collaborate with your team? Sound off in the comments!